Since the Custom Z was developed in 2003, the technology, craftsmanship and specifications of the Custom Z series have continued to improve to fulfill the needs of the highest level musicians. 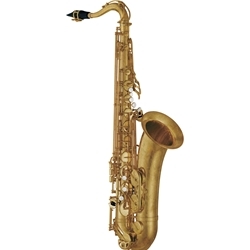 Finally, a modern sax that actually captures the sound and feel of those treasured classic saxes of the past - while adding state-of-the-art intonation and mechanism. Based on the scale of the classic '62' models, the new Custom Z saxes have bodies that are made of a special brass alloy for lighter weight, a great playing 'feel', and the kind of tonal flexibility you've always dreamed of. The Z plays evenly in all ranges, and gives you a huge dynamic range for as much - or as little - sound as you want. You can create whatever style tone you're after, from vintage to contemporary, and there's no need to sacrifice comfort for sound. These horns literally 'have it all'. The 82IIZU features a two-piece hydro-formed bell. The body, bell, and bow are annealed during production to make this horn more responsive and less resistant. The wide bore taper of the V1 neck provides a free blowing fell and the greatest possible flexibility. The new mechanisms on the 82ZIIU allow for faster action and easier repair. The blue steel springs provide for faster, more sensitive key response and higher resiliency. The left hand seesaw key has been redesigned to facilitate playability as well as feel more comfortable. The octave key has a unique new ball joint design for smoother, quicker action. The bell/body brace features two-point contact for enhanced projection and a free-blowing response. The eye catching engraving, as well as the unlacquered finish will give you the look of a custom horn. Also available in lacquered finish (see options below).